Lone Sailor. Photo by Dottie Miller. 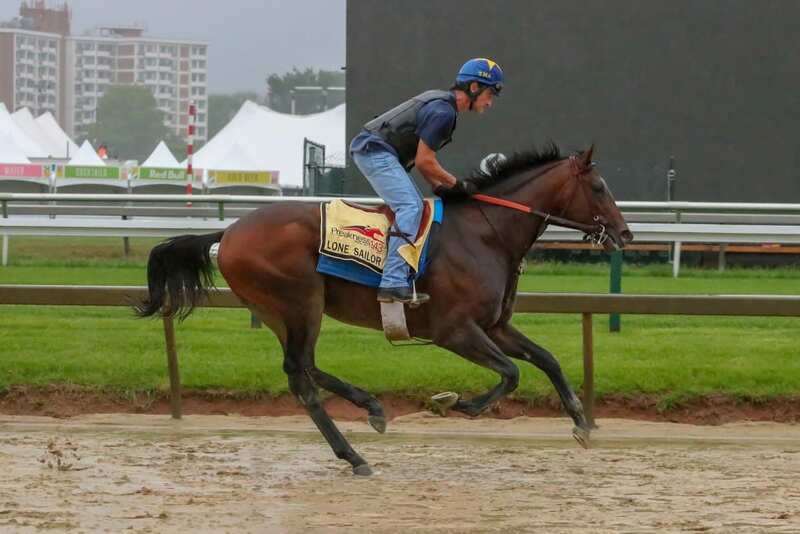 The time-tested axiom that pace makes the race is precisely the reason that trainer Tom Amoss announced today that he has decided to send Lone Sailor – runner-up in the Ohio Derby and the Louisiana Derby – to Sunday’s betfair.com Haskell Invitational at Monmouth Park, bringing the field to six for the track’s signature race. Amoss was looking for a race with enough speed for his colt to run at, and the Grade 1 Haskell, he said, provides that. Joe Bravo, MonmouthPark’s 13-time riding champion, will have the mount, with Lone Sailor arriving at Monmouth Park on Saturday, where he will bed down in Michael Stidham’s barn. Lone Sailor will join a field that includes Kentucky Derby runner-up Good Magic, Preakness runner-up Bravazo, Ohio Derby winner Core Beliefs, Navy Commander and Roaming Union. Trainer Dale Romans said today he still has not decided on a course of action for Promises Fulfilled or Mr Freeze, but expected to firm up his plans on Wednesday for both colts. Lone Sailor was beaten a nose in his last start in the Grade 3 Ohio Derby by Core Beliefs and missed winning the Grade 2 Louisiana Derby by a neck. The son of Majestic Warrior-Ambitious was eighth in the Kentucky Derby and fifth in the Preakness – just two lengths behind Justify in the middle leg of the Triple Crown. Though Lone Sailor shows a modest 1-4-1 line from 11 career starts, Amoss sees no reason why his horse can’t be a factor in the second half of a wide-open 3-year-old season with Triple Crown winner Justify sidelined by an injury. “When you look at the 3-year-old division exiting the Belmont Stakes it was Justify and then all of the rest,” said Amoss. “You could probably put 20 3-year-olds out there and they’d look a lot alike. That’s no disrespect to Good Magic, who will be a deserving Haskell favorite, or any of the other horses. Amoss said his charge has given all of the indications that he’s ready to go again following what will be a five-week layoff.